A Little Bit of Relief is a cooling, pain relief gel formulated with natural active ingredients for the temporary relief of mild arthritic pain, muscular aches, backache, cramps, muscular spasms, sciatica & sport injuries. 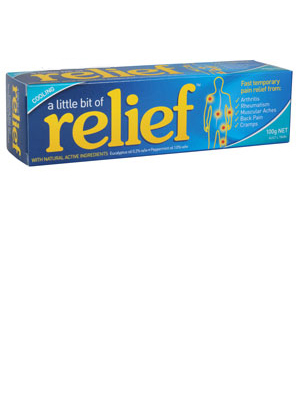 A Little Bit of Relief uses natural active ingredients including eucalyptus and peppermint oils. These ingredients have pain relieving properties to temporarily ease pain and reduce swelling, without the unwanted side effects that are associated with other medications. It is an easy to apply gel, for pain relief as you need it. A Little Bit of Relief has been formulated to be suitable for long term use, such as for the management of chronic pain. A Little Bit of Relief is available in two pack sizes - 100g tube and 150ml pump pack. This handy tube size is perfect for carrying in your bag or when travelling. Great for active people on the go. A Little Bit of Relief is 100% Australian owned, and proudly Australian made.